These informative posters make an excellent reference for students. 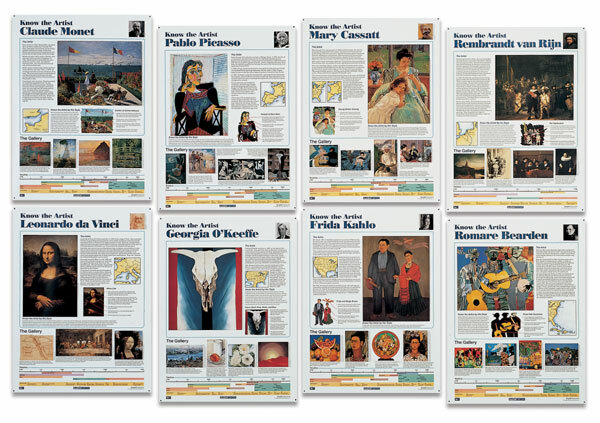 Each of these posters features five reproductions of the artist's work with explanatory captions, a description of the artist's life, the artist's portrait, and interpretive diagrams, maps, and timelines. Each color poster is printed on heavy cardstock with a protective coating and holes for hanging, and each set includes a teacher's guide. Each set contains eight, 18" × 24" (46 cm × 61 cm) posters. Set 8 — Features Avery, Bierstadt, Diebenkorn, Goldsworthy, Klimt, Rauschenberg, Woodman, Wright. Set 6 — Features Biggers, Magritte, Mondrian, Moses, Scholder, Skoglund, Toulouse-Lautrec, Vermeer. Set 9 — Features Butterfield, Chihuly, Johns, Kahn, Kelly, Moore, Rosenquist, Stella. Set 5 — Features Caravaggio, Dali,Degas, Gauguin, Kandinsky, Mailou-Jones, Nechita, Rockwell. Set 3 — Features Cezanne, Chagall, Fish, Homer, Klee, Raphael, Thiebaud, Wood. Set 10 — Features Dufy, Hockney, Jenkins, Motherwell, Munch, Pfaff, Rodin, Wegman. Set 7 — Features Haring, Johnson, de Kooning, Marin, Miro, Nevelson, Oldenburg and van Bruggen, Pollock. Set 2 — Features Michelangelo, Van Gogh, Calder, Matisse, Frankenthaler, Lichtenstein, Hokusai, and Hopper. 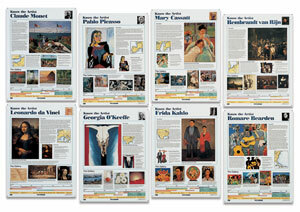 Set 1 — Features Monet, Da Vinci, Picasso, O'Keefe, Cassatt, Kahlo, Van Rijn, and Bearden.